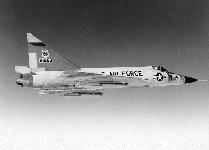 The primary mission of the F-102 was to intercept and destroy enemy aircraft. It was the world's first supersonic all-weather jet interceptor and the USAF's first operational delta-wing aircraft. The delta wing control surfaces eliminated the need for horizontal control surfaces (stabilizer and elevators). 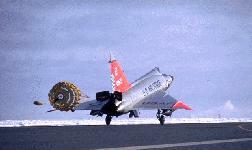 Built by Convair (General Dynamics); the F-102 was the first all-weather supersonic jet interceptor. First to use the 'area rule' design concept which pushed the speed beyond the sonic barrier, the F-102 was to be superseded by the more advanced F-106, which could exceed 1,000 mph. The concept known as the area rule is one of the great success stories of airplane design. The area rule says that the transonic wave drag of an aircraft is essentially the same as the wave drag of an equivalent body of revolution having the same cross-sectional area distribution as the aircraft. This fact, coupled with the knowledge of the shape that minimizes drag shows designers how to reshape the fuselage and other components of an airplane to reduce the drag of the total configuration. When an aircraft is sonic area ruled, the fuselage is shaped to an optimal area distribution. The result is the well-known "Coke bottle" shaped fuselage. 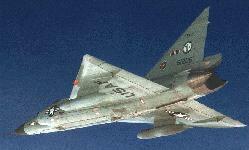 The first aircraft to which the area-rule principle was applied was the Convair F-102 delta-wing fighter. 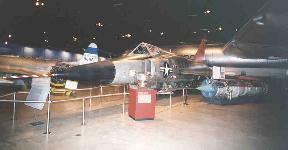 The YF-102 was basically an enlarged XF-92A delta. 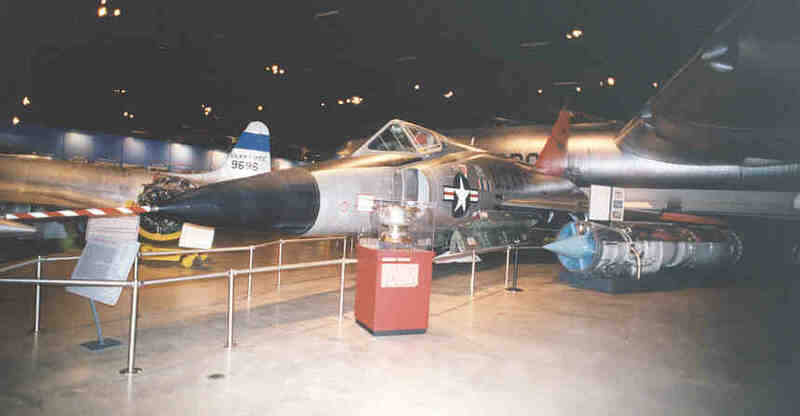 NACA, the Air Force, and the manufacturer already knew from wind tunnel tests that the YF-102's configuration rendered it incapable of meeting the interceptor performance specification, which called for supersonic speed. With its relatively low-thrust engine, the prototype of this supposed supersonic fighter was unable to pass through Mach 1.0. Convair redesigned the airplane on the basis of the area-rule principle developed by NACA Langley's Richard Whitcomb to give it supersonic performance. The modified aircraft easily passed through Mach 1.0 and entered the supersonic speed regime. 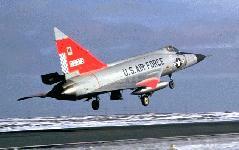 The F-102 made its initial flight on October 24, 1953, and became operational with the Air Defense Command (ADC) in 1956. 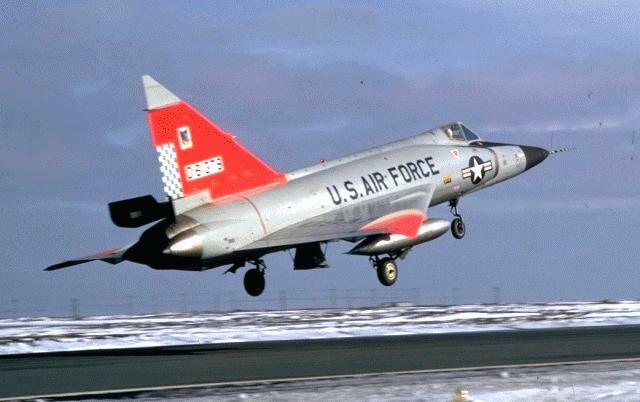 At the peak of deployment in the late 1950s, F-102s equipped more than 25 ADC squadrons. 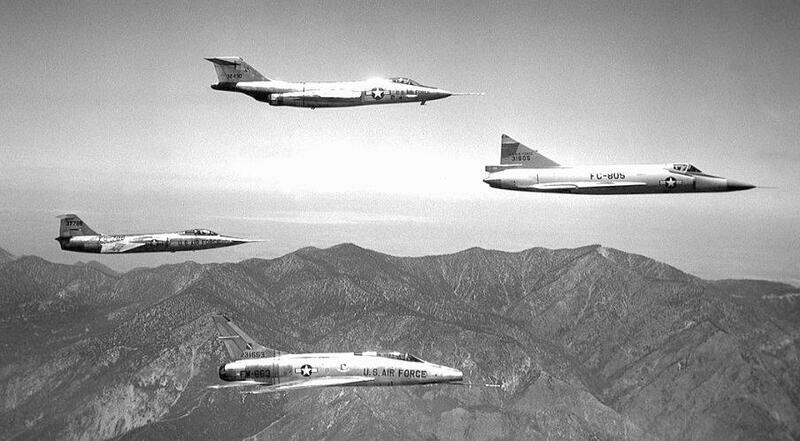 Convair built 1,101 F-102s, 975 of which were F-102As. The USAF also bought 111 TF-102s as combat trainers with side-by-side seating. In a combat situation, after electronic equipment on the F-102 had located an enemy aircraft, the F-102's radar would guide it into position for attack. 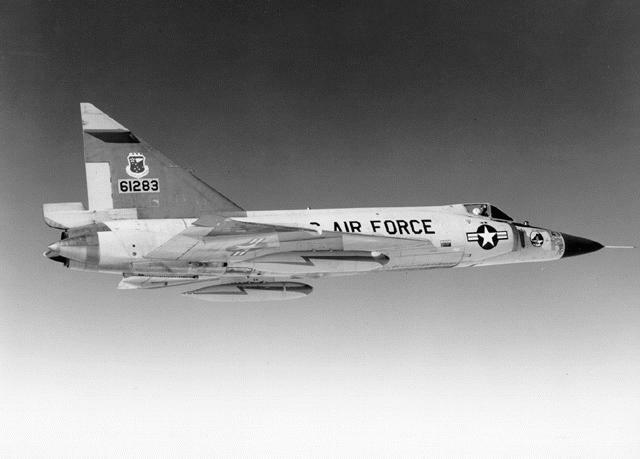 At the proper moment, the electronic fire control system would automatically fire the F-102's air-to-air rockets and missiles. This supersonic jet was one of the mainstays of the Air Defense Command in the 1960s. 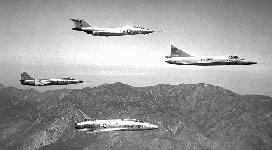 By 1974, surviving F-102s -- called "Deuces" -- had all been assigned to the ANG and to the air forces of Greece and Turkey. Armament Twenty-four unguided 2.75 inch rockets and six guided missiles. Engine One Pratt & Whitney J57; 16,000 lbs. of thrust, with afterburner.